Whilst watching an episode from YouTubes's Cosplay Chris I found out some devastating news regarding BATMAN's Tactical Uniform which will be featured in Zack Snyders 'Justice League ! The news I'm referring to is that Ironhead Studios will not be producing the costumes for 'Justice League' as Warner Bros, in their infinite wisdom did not give Jose Fernandez and his team the credit they deserved to the amazing work they did on producing the BATsuit and Wonder Woman costume in Batman v Superman: Dawn of Justice. Seriously Warner Bros, WHAT ARE YOU DOING! I'm speechless at this decision ... especially considering the huge backlash the film received. When you think about it, the only positive feedback that came from the film was the fantastic BATsuit that Ironhead Studios crafted. You would think that Warner Bros would do everything they can to make sure that the next film 'Justice League' is received as well as can be and that the one thing they could do was to keep the costume designers on board that gave them that edge... what a complete load of IDIOTS! Yes I understand you own the rights to everything another suppler does for the films you produce, but you didn't make the costumes... so give the company the credit it deserves! I can totally understand Ironhead Studios decision to pull away from any future projects with Warner Bros for not getting the credit they deserve and considering just how amazing they are at what they do, I'm sure they won't suffer for any future work with costumes like these. I'm sure Marvel will keep them well busy for a long time with future films ... just look at that beautiful Black Panther costume for a start! No wonder the latest Tactical Bat Suit is getting so much criticism regarding the addition of those goggles and the near blatant copy of the Night Owl cowl used in the Watchman film. Warner Bros listen up.. it's already starting and it's YOUR fault! Jose Fernandez and his team at Ironhead Studios are the geniuses that finally gave BATMAN the true comic book look he deserves and to at long last be able to turn his head. 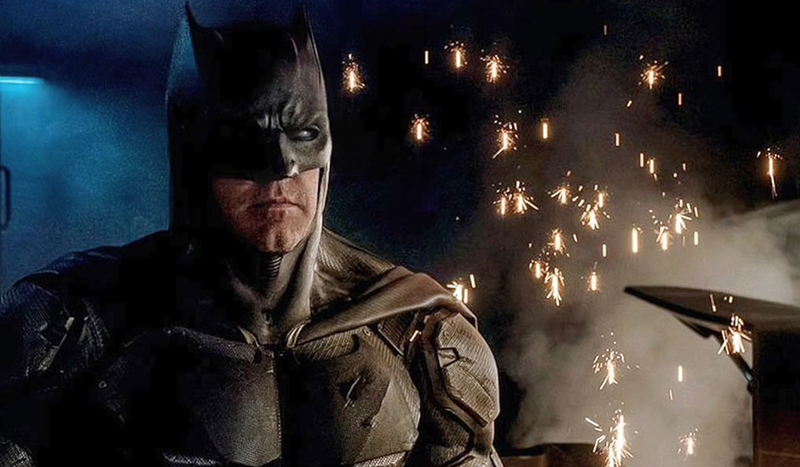 Warner Bros you've messed up, AGAIN ... we finally get a decent BATMAN, the actor Ben Affleck and the costume and he got to turn his head ... and now we're back to what looks like a static head turn because you've been childish and not given credit where credit's due ... you're going backwards not forwards! Even though it's us the fans that will suffer because we now get a substandard BATMAN again, I really hope the current costume designers won't be able to reverse engineer the cowls and find out how Ironhead Studios were able to perfect to head turn as that secret should stay with Ironhead Studios! The image on the right is the original and the one on the left has been photoshopped by someone (wish I could find out who!) taking away the goggles. He's included a pair of lenses over his eyes and made his ears straight again and I particularly like how he's put more of the neck back in, which is strange for me as that was always my one gripe with previous Batman costumes, how the neckline always looked to fat, but this just looks perfect. How utter AMAZING does this look! He looks like the true BATMAN again, straight off the pages of the comics! I only hope Warner Bros and Zack Snyder have seen this and realised just where they've yet again gone wrong! Why is it that the fans can do a whole lot better when it comes to costume design than these so called 'professionals'? That statement does NOT include Jose Fernandez and his team at Ironhead Studios, as they just nail everything they do ... maybe, just maybe Jose Fernandez is a comic book fan and that's why he gets it right as he knows the source material, where as the others haven't read a DC or Marvel comic in their life!